"I have just had the awesome pleasure of reading “Hair of the Were” and “Siren’s Tale” by a wonderful and gifted author. Eliza March blends in humor, sexual tension, and more in a can’t put it down book that will tantalize paranormal readers. This tale, pardon the pun, has it all. Think creatures of the night, creatures of the sea, Fae and water nymphs, and you would have the beginning of Adelaide’s journey in “As the Chair Turns” series. They all work in a totally cool hair and spa facility that caters to…you got it, paranormal creatures. And it doesn’t stop there, her best girlfriends ever are witches, and her best male friend is an alpha werewolf that would have her in his bed if she’d let him. Now, you would think with all of the above, that would be enough, but Delia as her friends call her has a chance at a rocking singing career. A career that could be forestalled by a sea-creature’s attack. Now if that don’t make you want to give up swimming, I don’t know what to tell you, but once you lay eyes on the Coast Guard hottie who makes Delia sing all the right notes, you might change your mind. The only other thing I can possible say is WHEN IS THE NEXT SAGA OF AS THE CHAIR TURNS COMING OUT?" 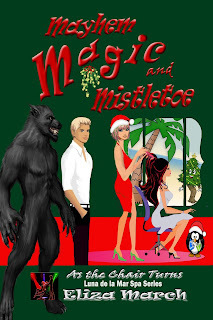 Twelve days before Christmas...expect Mayhem, Magic, and Mistletoe ...More of Delia's adventures.